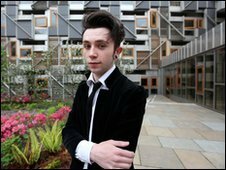 A photography graduate who describes himself as "a bit off the wall" has been selected to take a portrait of the Queen on behalf of the Scottish Parliament. Shaun Murawski, 23, will take the first ever formal portrait of the monarch to go on display at Holyrood. He was chosen from a shortlist of five finalists by a panel of judges. Mr Murawski's portrait will go on display in a public area of Holyrood later this year. All higher education establishments across Scotland which run photography courses were invited to nominate two graduates for the contest. The five finalists were invited to Holyrood last Friday to give a presentation on how they would tackle the photoshoot, and to show the seven-strong panel of judges examples of their work. Mr Murawski, who now works as a self-employed photographer in Glasgow, is a former HND student in photography at Reid Kerr College in Paisley. He said: "It is more than a dream, it's just unbelievable. "I will possibly be the youngest, and possibly most bit 'off-the wall' person she has sat for, and that makes this project even more exciting and makes me more determined to get the right picture. "I see the Queen as a steady figure in an every changing world and I hope to get that across in my work. I have never photographed a celebrity before and there is nothing like starting at the top." The judges included internationally-acclaimed photographer Harry Benson, who is famous for his portraits of figures including Martin Luther King, Winston Churchill, Barack Obama and The Beatles. The New York-based photographer has agreed to mentor the winning photographer before and during the royal photo shoot. Mr Benson said: "Any one of the finalists would have done an excellent job but Shaun just had the edge. His obvious passion and love for photography came through and you could see he has real talent. "He realises this is going to be the biggest project in his life so far as not many people, let alone those starting out, get to photograph the Queen. I am sure he will do a tremendous job." The Scottish Parliamentary Corporate Body agreed to commission the portrait in January after a recommendation by Holyrood's Art Advisory Group. It followed a request for a portrait of the Queen to go on display at the Scottish Parliament by Murdo Fraser MSP. Two of Harry Benson's portraits, of previous presiding officers, Sir David Steel and George Reid, are part of the Scottish Parliament's current art collection. New rules for burials and cremations in Scotland are agreed by MSPs in the wake of the baby ashes scandal.